A Pavlova typically garnished with strawberries, passionfruit, kiwifruit and cream. Pavlova is a meringue-based dessert named after the Russian ballerina Anna Pavlova. It is a meringue dessert with a crisp crust and soft, light inside, usually topped with fruit and whipped cream. The name is pronounced /pævˈloʊvə/, unlike the name of the dancer, which was /ˈpɑːvləvə/. Pavlova is made by beating egg whites (and sometimes salt) to a very stiff consistency before folding in caster sugar, vinegar or another acid (e.g. 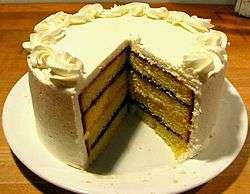 cream of tartar or lemon juice), cornflour, and sometimes vanilla essence, and slow-baking the mixture, similar to meringue. An Australian Christmas dessert pavlova garnished with strawberries. Leach, Helen M. (1997). "The pavlova cake: the evolution of a national dish". In Walker, Harlan. Food on the Move: Proceedings of the Oxford Symposium on Food and Cookery, 1996. Devon, England: Prospect Books. pp. 219–223. ISBN 0-907325-79-3. 1 2 Boylen, Jeremy (reporter) (2004-08-20).Pavlova George Negus Tonight, Australian Broadcasting Corporation. 1 2 3 4 5 6 Leach, Helen (2008). The Pavlova Story: A Slice of New Zealand's Culinary History. Otago University Press. ISBN 978-1-877372-57-5. ↑ Dictionary.com, "pavlova", in Dictionary.com Unabridged (v 1.1). Source location: Random House, Inc. http://dictionary.reference.com/browse/pavlova. Available: http://dictionary.reference.com. Accessed: 26 April 2009. 1 2 "Pavlova research reveals dessert's shock origins". Good Food. Retrieved 2015-10-31. ↑ "Pavlova, History of Pavlova". WhatsCookingAmerica.net. 1935-04-02. Retrieved 2010-11-16. ↑ "'Australian Flavour', Pavlova Time Line". AustralianFlavour.net. 2007-11-08. Retrieved 2010-11-16. ↑ "An Elaborate Cake". The Advocate, republished by Trove, National Library of Australia. 1935-09-14. ↑ "These are... OUT of the BOX!". The Australian Women's Weekly. Australia: National Library of Australia. 10 July 1937. p. 39 Supplement: 16 Pages of Cookery. Retrieved 6 January 2011. ↑ "Antipodean palaver over pavlova". BBC News. 2005-07-19. Retrieved 2009-07-17. ↑ "IN THE PAPERS.". The Argus. Melbourne: National Library of Australia. 17 November 1928. p. 5 Supplement: The Argus. Saturday Camera Supplement. Retrieved 6 January 2011. ↑ "Pavlova Recipe". Elise.com. Retrieved 2010-11-16. ↑ "Traditional Pavlova Recipe". foodtolove.com.au. Retrieved 18 May 2016. ↑ "How to Make Perfect Pavlova and Meringues". Foodlovers.co.nz. Retrieved 11 July 2014. ↑ "Contains Pavlova Toppings". InMamasKitchen.com. Retrieved 2010-11-16. ↑ "Students make world's biggest Pavlova". The New Zealand Herald. 2005-03-21. ↑ "Charitable Kiwi chef whips up giant pavlova". NewZealand.com. 2010-08-06. Retrieved 2010-11-16. ↑ "Complaint 06/153". Advertising Standards Complaints Board. 2006-05-19. Retrieved 17 November 2010. 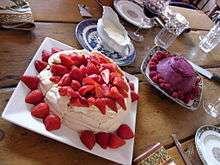 Wikimedia Commons has media related to Pavlova.